More than just helping calamity victims build new and more secure houses for their families, a Gawad Kalinga partnership is about building lasting friendships. A commitment among stakeholders to share of themselves — their time, talent and treasure — naturally evolves as they get to know one another while doing GK together. At some point, GK ceases to be a housing program and becomes an avenue for caring and “friends-raising”. 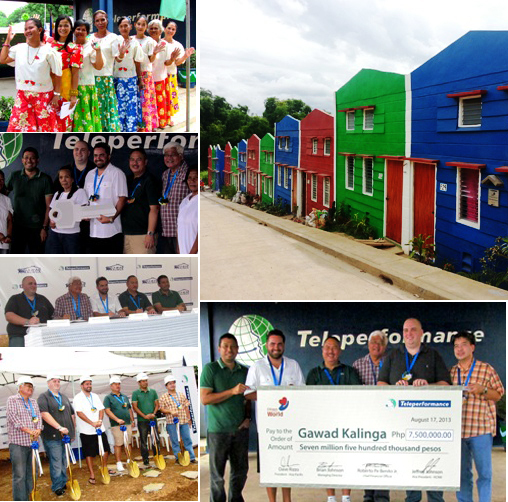 Such is the case for Teleperformance Philippines and its CSR arm, Citizen of the World Foundation (COTW), who celebrated its third year of involvement with the victims of Typhoon Ondoy in Tanay, Rizal. 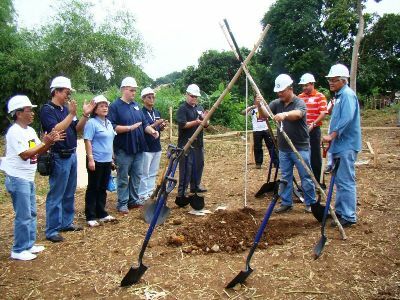 In August of 2010, COTW and GK broke ground for 20 houses to help Ondoy flood victims get back on their feet. Jeffrey Johnson, COTW President, commented that the first time they visited the relocation site, there was nothing there but grass and some temporary sawali dwellings and that there was a sense of despair and distrust among the people. Three years later, August 17, 2013, COTW, in partnership with GK and the local government of Tanay, has helped build 50 houses, a SIBOL Day Care Center, an IT Learning Center, a 140 square meter Multi-purpose Hall with office, a Mini Garden and a Children’s Playground. They even helped furnish each house with a steel framed double deck bed and a monoblock table to ensure that the new homeowners would enjoy the benefit of a real bed to sleep in and a table to share their meals on. To top it all off, COTW took this occasion to announce their commitment to help build another 50 houses to bring the total number of houses in the village to 100. More important, though, is that all these infrastructures and amenities are simply testaments to the relationships built through three years of working together. 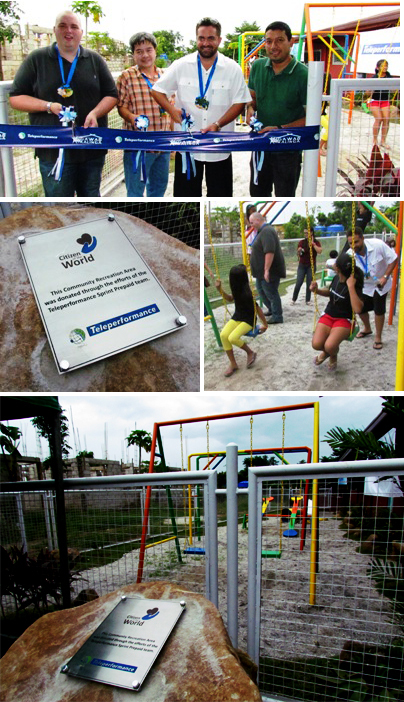 COTW regularly organizes service and building activities for Teleperformance employees, families and friends. They are in the Tanay village site at least twice a month to actually help the community in house construction and other programs. They brave the long trip and rough roads leading to the village each time, just to be able to share special “moments” with the village residents. The village homeowners have since learned to relate to the Teleperformance-COTW volunteers, not as benefactors, but as real friends. better future for our children” – Mayor Rafael Tanjuatco Jr. The GK communities built through sweat and tears of our homeowners, corporate and LGU partners and volunteers are truly not just new houses that shelter families. They are monuments to friendships, nationhood and collective vision. 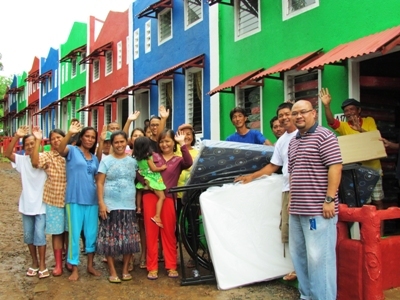 "We are one with Gawad Kalinga in inspiring hope and rebuilding the lives of the needy. We are fortunate to have the opportunity to make a difference in the community, not only by providing financial aid and building shelters for families, but more importantly, by encouraging them to be productive and responsible citizens," added Teleperformance Asia Pacific president David Rizzo. Meanwhile, GK founder and chair Antonio "Tony" meloto congratulated Teleperformacne for its continuous help in developing the village. "Today we see the power of solidarity and the miracles taht we can create together. I can see that what people have received from us here is hope which Teleperformance has built with passion and dedication," Meloto noted. "You have not only given them hope but restored their dignity. You gave them security and a dream that will be passed on to their children. I think leadership is also about nurturing, and you have nurtured this community very well because you now have made them amazing nation builders," Meloto further said. 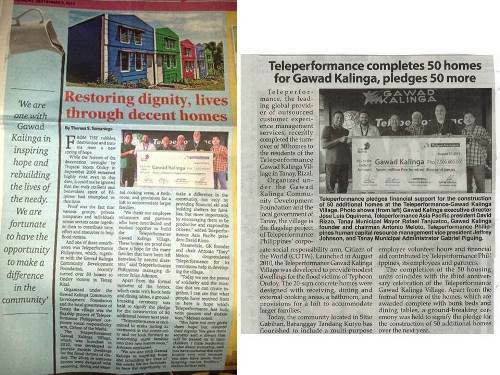 "The completion of the 50 housing units coincides with the third anniversary celebration of the Teleperformance Gawad Kalinga Village. Apart from the formal turnover of the homes, which are awarded complete with bunk beds and dining tables, a ground-breaking ceremony was held to signify the pledge for the construction of 50 additional homes over the next year." Gawad Kalinga is not a charity, rather, it's an organization that aims to end poverty by building empowered and productive communities. This would not be possible without the partners who have journeyed with us in changing the lives of others. Like Teleperformance, you too can be a hero to the poorest of the poor and partner with us in making sure that no one is left behind. Email info@gk1world.com to find out how. TOGETHER, WE CAN END POVERTY.